- Free Republic: The Story of Herbert J. Yates and Republic Pictures""
Sean Thornton (John Wayne, Sands of Iwo Jima), an American boxer with a tragic past, returns to the Irish town of his youth. There, he purchases his childhood home and falls in love with the fiery local lass, Mary Kate Danaher (Maureen O Hara, Rio Grande). But Kate's insistence that Sean conduct his courtship in a proper Irish manner with matchmaker Michaleen Oge Flynn (Barry Fitzgerald, Going My Way) along for the ride as chaperone is but one obstacle to their future together; the other is her brother, Red Danaher (Victor McLaglen, Rio Grande), who spitefully refuses to give his consent to their marriage, or to honor the tradition of paying a dowry to the husband. Sean couldn't care less about dowries or any other tradition that might stand in the way of his happiness. But when Mary Kate accuses him of being a coward, Sean is finally ready to take matters into his own hands. 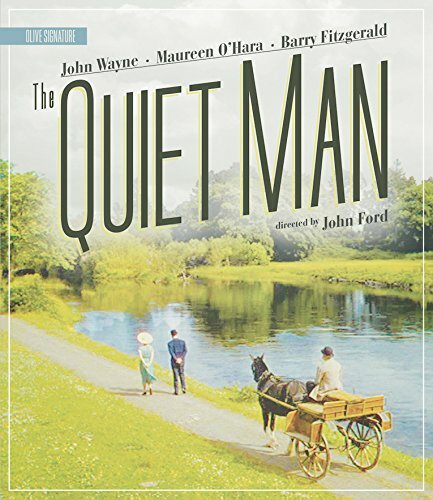 The Quiet Man would go on to win two Academy Awards in 1953, including Best Director (John Ford) and Best Cinematography and received five more nominations including Best Picture, Best Screenplay and Best Supporting Actor (McLaglen)."